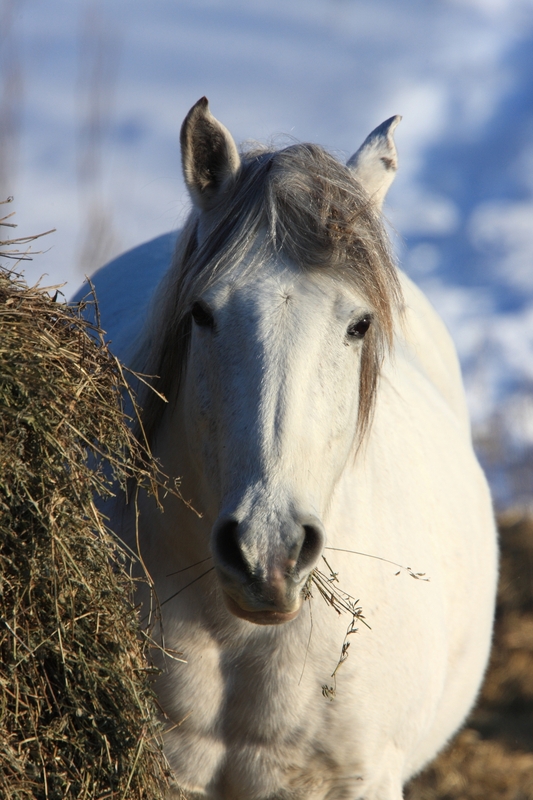 In equine nutrition solid feeds fall into three categories: forages (such as hay and grass), Concentrates (including grain or pelleted rations), and supplements (such as prepared vitamin or mineral pellets). 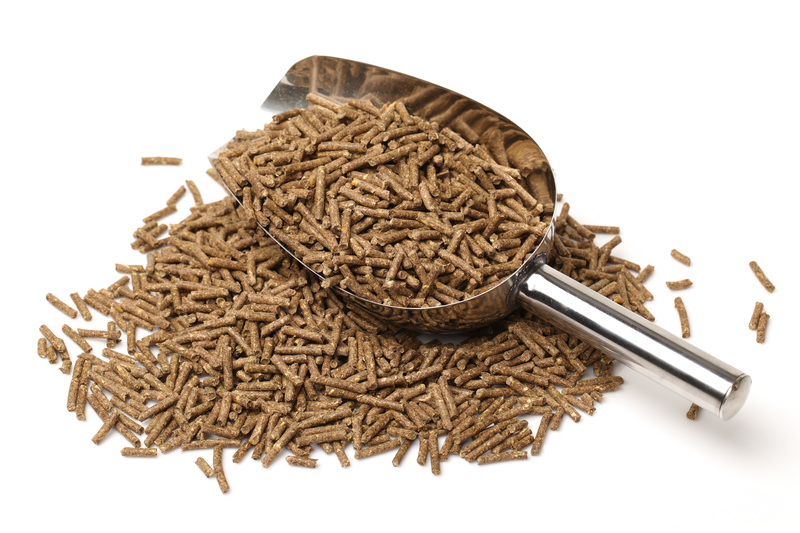 Basically any whole grain, formulated feed (sweet or pellet) or other non-forage, non-vitamin/mineral supplement is referred to as a Concentrate. The average horse should be able to get what it needs for maintenance from a diet of good quality forage. Therefore, Concentrates should be considered only if certain nutrients are missing from the forage to meet the needs of the horse. In general, a mature horse does not require the energy that would be provided by Concentrate type feeds unless the horse is used for more than light work, in production such as a lactating mare or a breeding stallion, or if the horse is growing. It’s important that horse owners understand the importance of a balanced the ration where the proper amount and ratios of minerals, vitamins, proteins, fats, carbohydrates, etc., are maintained for correct growth and maintenance. 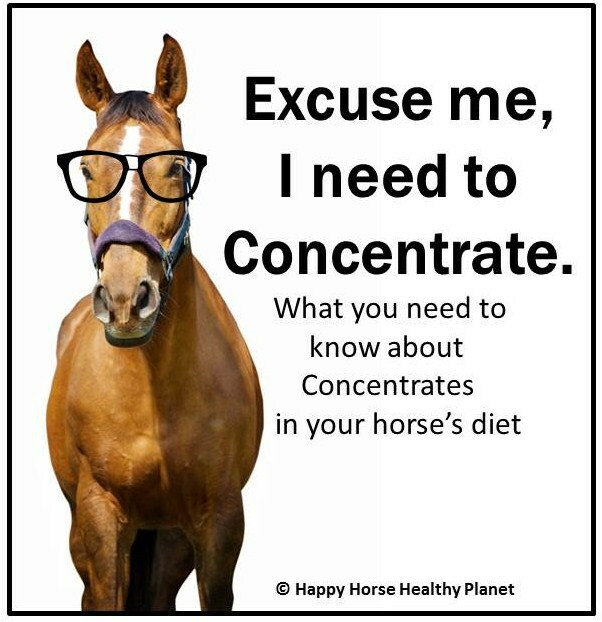 Too many times horses are over fed rather than underfed Concentrates. Sorry if I sound like a broken record but Concentrates should be fed at as low a level as possible with forage making up the majority of the equine diet. Even in horses with needs beyond maintenance Concentrates should be less than 50% of the diet with a 20 – 30 % Concentrate level more desirable. 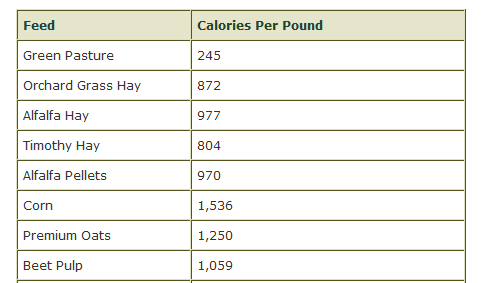 This would mean that a 1000 lb mature horse in light work being fed at 2% of its body weight or 20 lbs of feed per day, would receive approximately 14-16 lbs of hay and 4 – 6 lbs of Concentrate. Of course as you can see from the chart, different feedstuffs have different energy density so the amount of a Concentrate that is fed should be reflective of the overall DE of the entire ration. 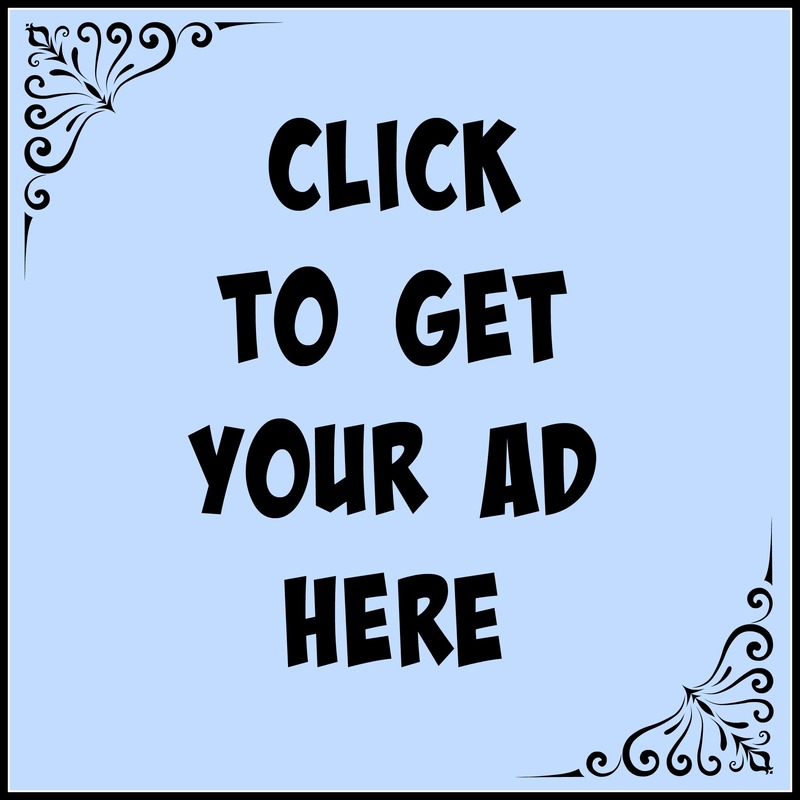 For more about determining caloric needs see Calories. 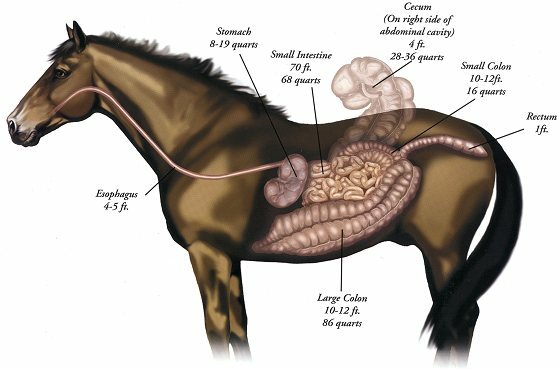 Concentrate are digested in the horse’s stomach and small intestine. 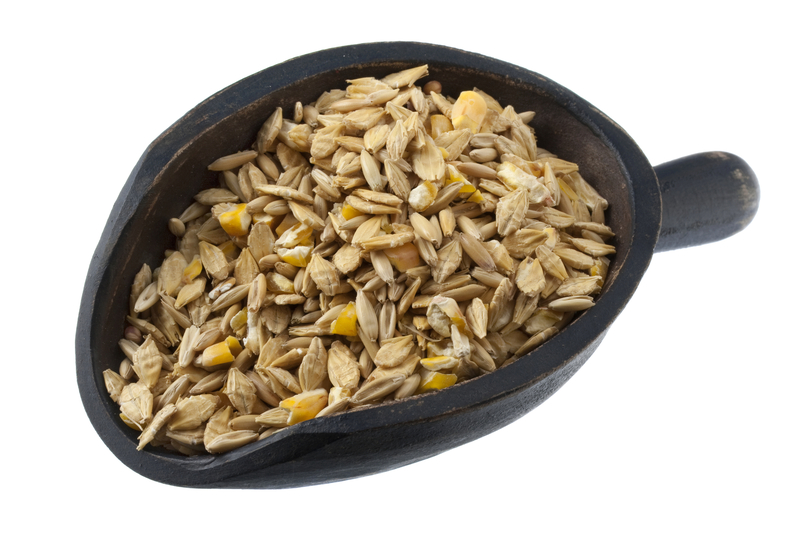 It’s where the breakdown and absorption of the grain portion of the diet takes place. Forages pass through and are digested through fermentation in the hindgut. With Concentrates, the acidic environment of the stomach helps with initial breakdown but little to no absorption occurs in the stomach. Concentrates fall to the bottom portion of the stomach where the proteins and fats are reduced by the gastric juices. After, the small intestine further reduces proteins, fats and carbohydrates for absorption through the membrane of the small intestine. Hay will pass through the stomach quickly, as it is not digested until it reaches the hind gut. It’s important to have a slow passage of the concentrate portion of the diet to allow for proper digestion in the small intestine. If the Concentrate passes through too quickly and reaches the hind gut (large & small colons and the cecum), the pH in the cecum will become more acidic, killing bacteria and potentially causing colic or laminitis. Feeding smaller frequent portions of Concentrates helps with this process. In the past Concentrates were typically the COB formula, Corn, Oats and Barley. 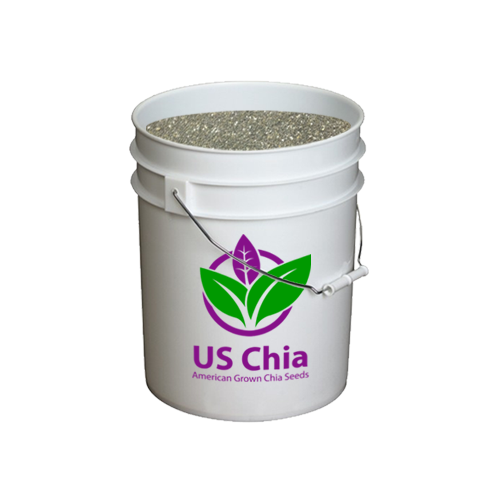 Over the last 20 years however, equine nutrition research has discovered that this mix is too high in starch and non-structural carbohydrates for most horses. In addition the vitamin and mineral balance in this common feed mix was not balanced with consideration for the demands of different horse needs. 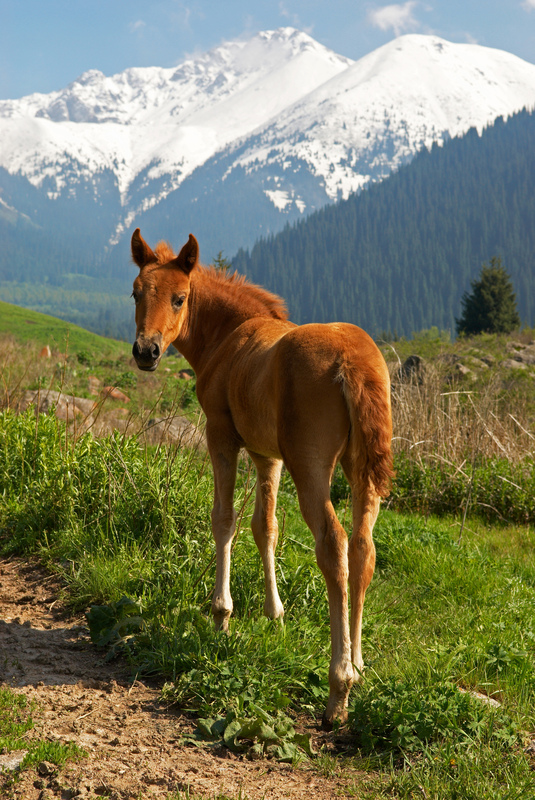 In today’s feed market a wide range of commercially prepared equine Concentrates are available. These Concentrates are specially formulated to be balanced for various horse needs; from growing rations for young horses with higher protein needs, to rations with high fat for horses needing additional calories to maintain their body condition. Many horse owners still create their own rations by combining different Concentrates with a ration balancer for protein, vitamin and mineral fortification. 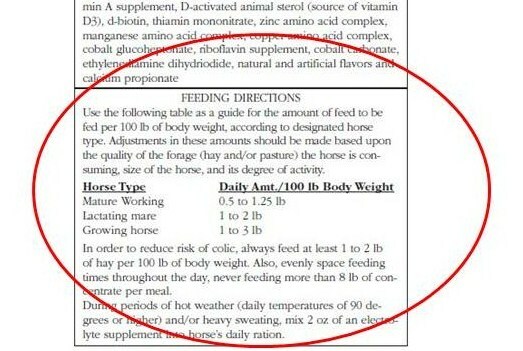 I will caution against this practice as additional supplements added to the diet can interfere with proper balance of the ration and may not provide the adequate nutrients for that specific horse’s needs. It is important that all horse owners know their particular horse’s nutritional needs for the “job” they are doing. A ration formulation should always begin with determining the quality and quantity of the forage being fed then providing a balanced Concentrate if needed. Balancing rations can be a fairly complex process for a horse with a “job” beyond one that allows it to be able to survive on a forage only diet. Professionals, and commercial feed companies, who balance rations do so based on research-proven equine nutrient requirements and use complex ration formulation software that take the guess work out for the horse owner. This makes it is easy for the horse owner to select an appropriate product for their needs as long as they follow label directions. If a Concentrate is fed at lower than recommended amounts, a vitamin/mineral supplement must be added as these feeds are formulated to be fed at this rate for the horse to receive proper nutrients from the feed. I hear it time and again that an owner feeds “just a handful” of grain. Well, you might as well not feed any Concentrate as “a handful” is just a treat and does not have anything added in nutritional value. 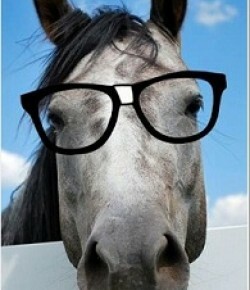 It’s easier now than ever for a horse owner to determine if a horse needs a Concentrate and then to determine what type. 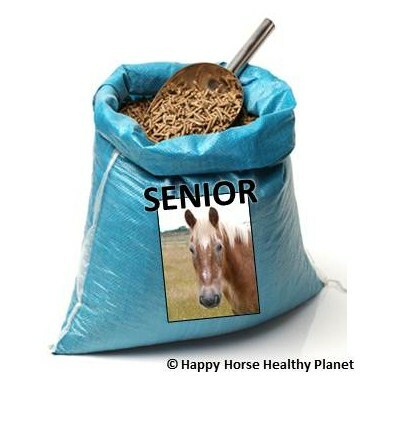 For horses in heavy work and with high energy demands a sweet feed type Concentrate may provide the calories they need. While an older horse with dental issues might do better with a pelleted Concentrate that can be soaked. And still yet, the horse with metabolic issues would benefit from a beet pulp based Concentrate that has a low NSC (carb) value. Heck, anymore, a visit to a feed store is much like the cereal aisle of the grocery store; something for everyone! If you still have questions about whether your horse needs a Concentrated feed in his ration, or which one to feed, contact your feed store or schedule a consult with the Nerd.